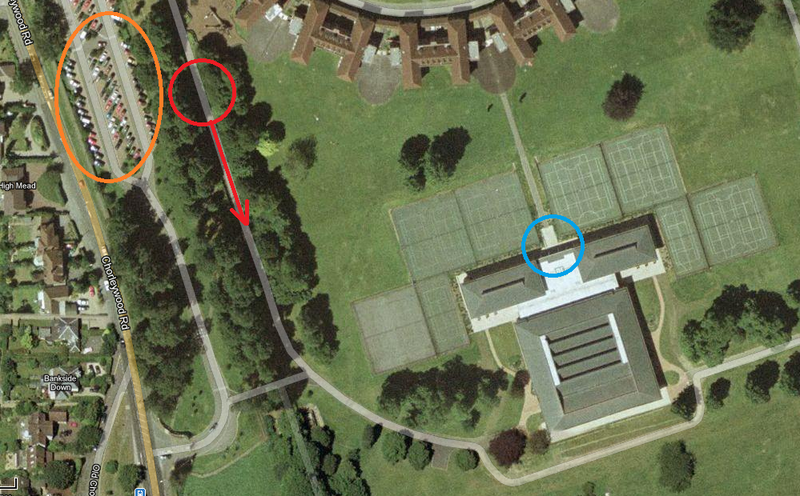 Once you have parked in the car park (Orange circle) you will need to walk over to the walking path that runs alongside the car park, there is a entrance way with a sign post saying “Nuffield Health Gym/Sports Centre” walk across the path and through the gate where you will find a long path (Red circle). Follow the path round to the front of the building (it faces back towards the school buildings) (Blue Circle) and walk straight in towards the glass viewing panels. We are ‘down’ in the main hall and stairs can be found by turning right and going through the double doors just off to the left at the end.